Germany’s largest energy services company Innogy SE is setting up shop in California in a bid to grow its emerging line-up of EV/e-mobility technology and services. Marking two years of close collaboration, Innogy SE and Oxygen Initiative at the end of February announced they were readying the US launch of the former’s blockchain-based Share&Charge electric vehicle (EV) digital wallet following successful testing in Germany. According to a July 6 news release, new Los Angeles-based subsidiary Innogy e-mobility US LLC will provide a range of e-mobility technology and services in California and other US states that have instituted zero-emission requirements for new vehicles. EV charging has emerged as a prospective, pivotal focal point for blockchain-based transaction systems developers as technological advances and supportive government and regulatory are enacted. Variations on the EV charging-digital wallet theme are coming in fast and furious, from Berlin-based Ubitricity’s streetlight charge points and smart meter charging cables to Singapore-based Blockchainfirst’s Ethan BioT charging station. Innogy SE is one of two core aspects of the reincarnation of Germany’s largest energy utility group, RWE, which decided it needed to reinvent itself amid the EU leader’s phasing out of nuclear power (scheduled to be completed in 2022) and the rapid growth of distributed residential, commercial and industrial wind and solar energy. According to the company, Innogy e-mobility US LLC’s portfolio spans the entire value chain – “from the production, marketing, supply and construction of charging solutions right up to the operation of charging infrastructure based on its in-house software,” as well as marketing a range of additional EV electricity services. On the software side, Innogy Innovation Hub worked in partnership with Ethereum developer Slock.it to create the Share&Charge e-mobility digital wallet. Share&Charge offers drivers of plug-In EVs the ability to pay for highway tolls, parking fees and electric charging, as well as collect fees for car-sharing, while on-the-go. On the hardware side, Innogy recently announced a partnership with BTCpower which entails the latter joining Innogy to build, install and operate high-speed EV charging systems. Part and parcel of the initiative, BTCpower’s EV charging stations and services have been upgraded to include an expanded range of functions developed and run by Innogy in Germany. In addition, Innogy has been conducting EV research with the University of California in San Diego since 2015. “E-mobility technologies are ushering in advancements in transportation that could foster the adoption of clean-tech autonomous vehicles (AVs) and electric vehicles (EVs), which could bring the dream of less congestion and pollution, shorter commutes and lower operating costs into reality,” Oxygen Initiative founder and CEO Stephen G. Davis said at the time. “We’re excited to do our part by introducing blockchain technology for the mobility space to the United States, starting with access and payment solutions for electric charging stations. Soon, instead of paying with cash or credit cards, your vehicle could sell back excess energy during peak pricing events and pay for vehicle operation. “By teaming up with automakers, Oxygen Initiative will be able to solve the interoperability problem caused by various types of charging stations and charge card and payment systems to accelerate revolution-scale adoption of FAVES,” he explained at the time. “We believe the future of personal mobility will be autonomous, connected, electric and shared. Blockchain technology can be a catalyst for this, facilitating secure, simple and efficient transactions among all stakeholders of the mobility sector,” added Thomas Birr, Innogy SE senior vice president, innovation and business transformation. Cameron Funk will lead Innogy e-mobility US. A founding member of the EVCA (Electric Vehicle Charging Association), Innogy and Funk have contributed to advances in electric mobility in the US. 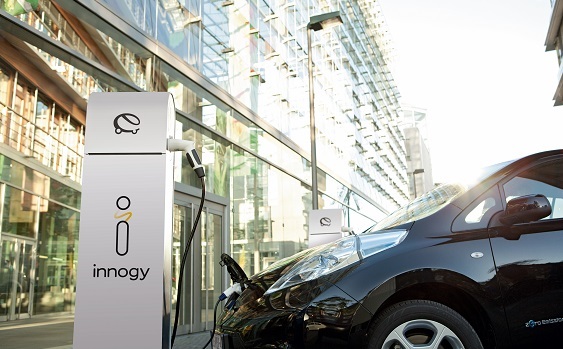 In addition, Funk has been integral to development of EV charging and infrastructure programs for major automotive manufacturers, Innogy highlights. Innogy owns and operates one of Europe’s largest EV charging networks, managing some 5,700 EV charging points. In Germany, the company has partnered with over 140 municipal utilities to establish one large interconnected charging network. Among others, in California Innogy e-mobility US will be competing with market leader ChargePoint. ChargePoint reportedly operates the world’s largest network of EV charging systems with more than 38,000 points across North America. For its part, ChargePoint is intent on expanding in Europe. It recently secured $43 million in venture capital from a group of investors led by Siemens, with which it will work to develop EV charging stations in Europe, according to a news report.